In memory of all the Dads who are no longer with us. Hello Everyone, Terre here with a semi-simple card that you can create fast and simple! 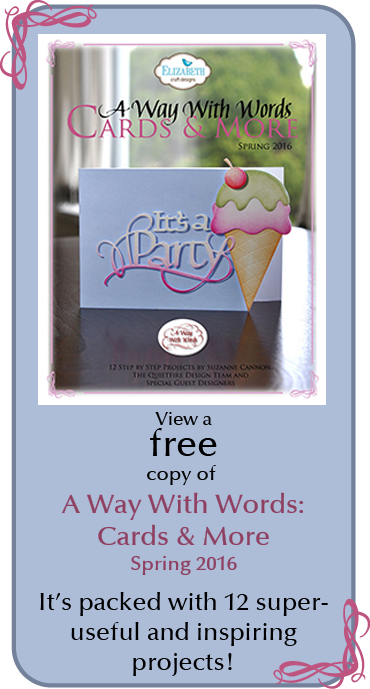 Simply choose a wonderful sentiment from Quietfire Designs. For this card I chose to use a special sentiment that has so much meaning right now in my life, "I Wouldn't Have Missed Being Your Friend", I created this card to send to my friend, four weeks ago she was diagnosed with stage four cancer and I am truly heart broken. When I looked through my amazing stamps from Quietfire Designs this one just spoke to me so I will be sending this to my friend. I inked up my Spellbinders 3D M-Bossabilities Framed Labels Eighteen using Tsukineko Versa Magic Perfect Plumeria chalk ink and white cardstock, ran it through my Grand Calibur Machine and just look at that perfect letterpress technique. I took my sentiment stamp and Tsukineko Memento Black ink and stamped it right on my embossed image. Just look at that detail! Robyn here ,with a shaped card base, pop up card. The card base is cut with the largest of the Spellbinder Grand Labels One. To cut the shaped card, fold your base and position the fold just inside of the cut line of the dye. All of the Lables One dies work together, as you can see here as I built up the layers. I have fond memories of my Dad in the ocean, so the sea themed patterned paper became the next layer, one size smaller of the same die. I wrapped the left side around to the back of the card just for fun. He was not a glittery guy, so I'm doing my best to keep it simple and ,well, not glittery! The quote, from the Happy Family Days collection is stamped with VersaFine sepia and thermal embossed clear. The frame, from the same collection is stamped with Delicata Golden Glitz- no embossing needed- on Scalloped Labels One, layered on Decorative Labels One, and popped up with a bit of fun foam. The inside of the card was created with 7 layers of text weight paper cut with the Spellbinders Dalhia and cleverly glued together with glue dots and some sprigs of Spellbinders Foliage. The Weed stamp is one of a set by Bibi, a Quietfire Creations Guest designer.Thanks Bibi! 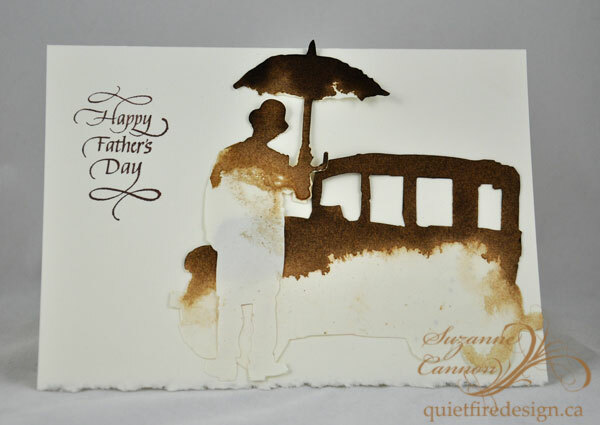 More on the backstory of my Dads and the inspiration for this card on my blog here. The Happy Family Days Collection with have you creating all occasion cards with ease! If you have a suggestion for a "Happy" sentiment to add to the collection, please leave us a comment! I side folded my white cardstock (5.5"w x 4.25"h). Applied Sookwang tape, keeping a 1/8" border all around. Started adhering my drop out squares (light mint Bazzill monochromatic cardstock) and leaving a space between them. I also added a piece of green Ruche paper (I ran out of little squares sigh...). When done, sprinkled with Glitter Ritz micro fine glitter "Bronze", burnished well. Stamped the butterfly circle on white cardstock with Versafine Black Onyx and clear embossed. 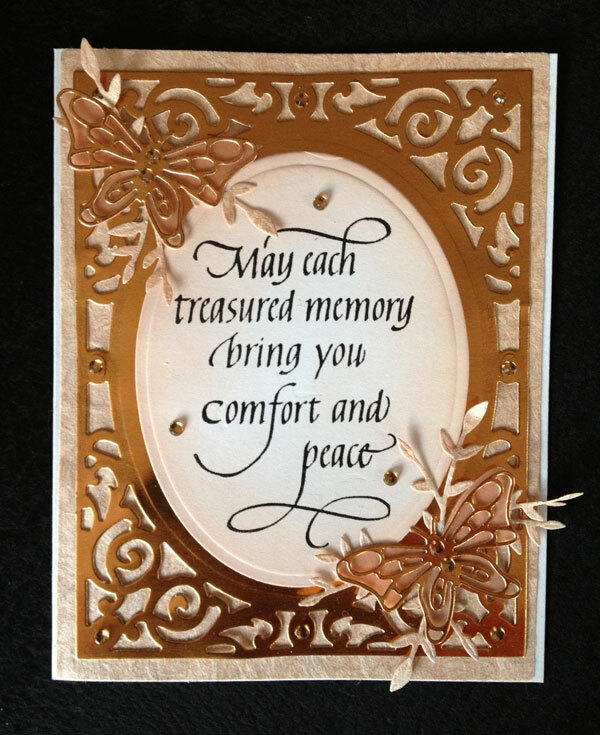 Die cut with Spellbinders Classic Scalloped circle large set. Used tracing paper to make a stencil/mask of the inner portion of the circle so I could stamp the flower sprig (Flourishes "Magnolias") also with the black. Colored with Prisma colored pencils. Stamped a portion of the Garden Delights stamp and hand cut with a wavy contour. Sponged a bit of brown on the edges and adhered to card. Adhered the circle. Die cut the butterfly (E Craft Designs "Small Butterfly") from white cardstock. Sponged distress Worn Lipstick, then applied Perfect medium and embossed with Stampendous Stamp 'n Bond embossing powder. Sprinkled Ranger's Stickles Fine Glitter "Stardust" and reheated to set. Adhered to card with a foam square. Hope you give a try to using your drop out pieces. There are some interesting things you can do with them. Garden Delights Mixed Media Canvas! Good morning it’s Sherry here with you another day this week! I’ve had this idea for a project using Garden Delights for some time and finally put it all together yesterday. The project started with a 6x6 piece of watercolor paper that was painted with acrylic paints. Using Spellbinders Butterfly Garden Impressabilities as a stencil, Broken China Distress Ink Refill was misted over a portion of the paper. In alternating corners a white mist was sprayed using a stencil die cut with Spellbinders Grateful Lattice. A few acrylic paint splatters were added along with some gold from a gold leafing pen. The sentiment was stamped in black pigment ink and embossed with clear embossing powder. Before adding anything else to the page, the edges were distressed with a pair of scissors and sponged with Antique Linen Distress Ink. 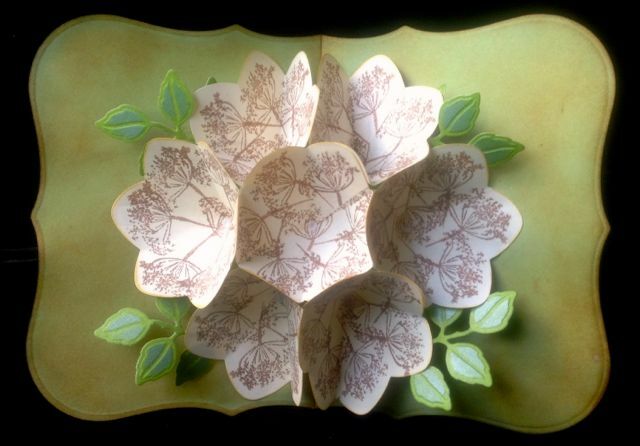 The flowers were made using a stencil die cut from chipboard using Spellbinders Jewel Flowers and Flourishes. White embossing paste was added in varying heights and thickness and allowed to air dry. Once dry, they were colored with Distress Inks in Wild Honey, Rusty Hinge, Seedless Preserves and Aged Mahogany. The stems for the flowers were made using another stencil for a guide – faint pencil lines were drawn and then colored with Marine Green and Spanish Olive alcohol markers. While working on the page, it struck me that I needed something to mount it on, since it was too big for a card. I finally decided to mount the page on a 6x6 canvas which was painted black and then some gold accents were added to the edges. The page was adhered to the canvas with 1.5” double-sided tape. As the finishing touch, I found some vintage gold buttons in my stash that I used for the flower centers. Good morning! Sherry here today and I have a project to share using Graphic 45 French Country and the new Quietfire release, Home – Congratulations! The base is a page from an old chipboard album, that was covered with papers from the Graphic 45 French Country Collection. 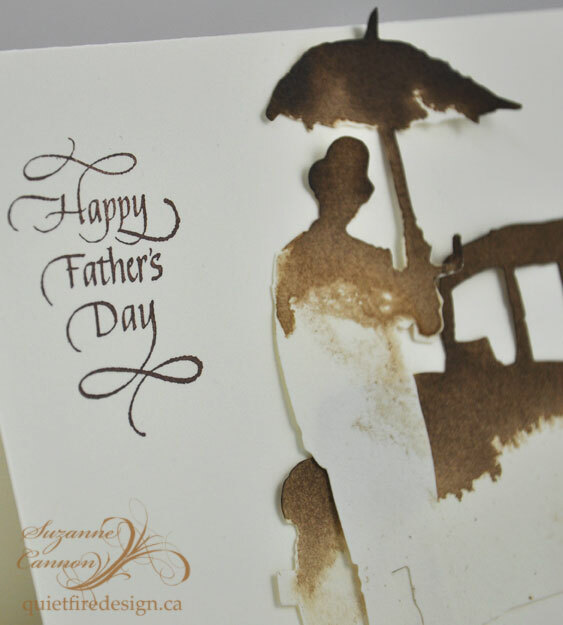 The edges of the paper were sanded away and then sponged with Antique Linen Distress Ink. 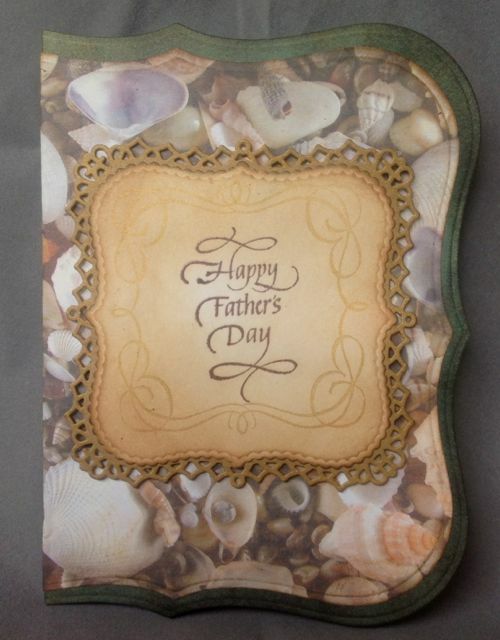 The black border at the bottom was die cut/embossed with Spellbinders A2 Scalloped Borders One. The frame was made from a piece of chipboard that had been covered with another paper design from the collection. It was die cut with Spellbinders A2 Distressed Edges. 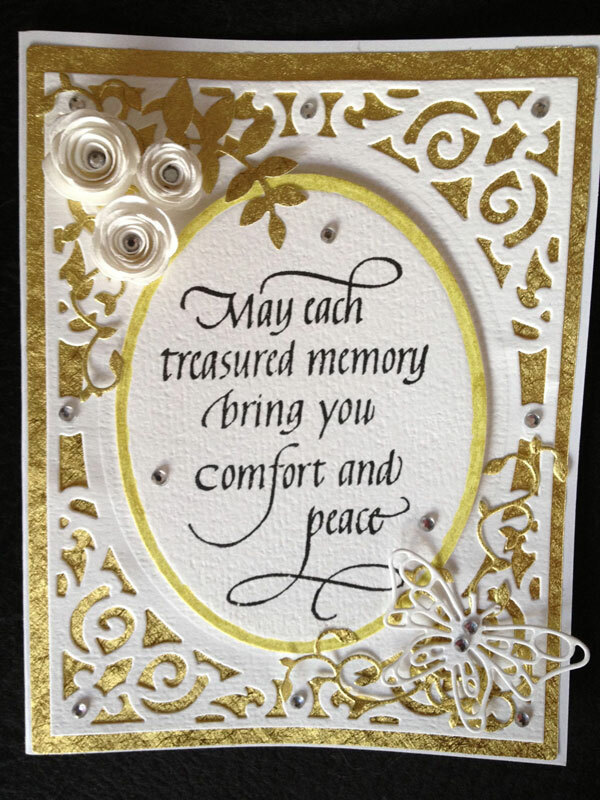 The sentiment was stamped in black and then die cut/embossed with Spellbinders Labels Twelve. While the paper was still in the die, Antique Linen was used to stencil in some color leaving a nice white edge around the sentiment. The seam binding ribbon was dyed with Aged Mahogany Distress Stain and Ink. The flower was die cut from watercolor paper with Spellbinders Jewel Flowers and Flourish. Because I wanted it to resemble the sunflowers in the paper, it was colored with Mustard Seed and Wild Honey Distress Stains and highlights were added with Rusty Hinge and Fired Brick inks. That’s all for me today! Thanks for stopping in and joining me! 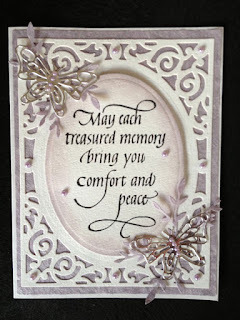 Joy Hauck created this beautiful set of cards for a recent family loss. 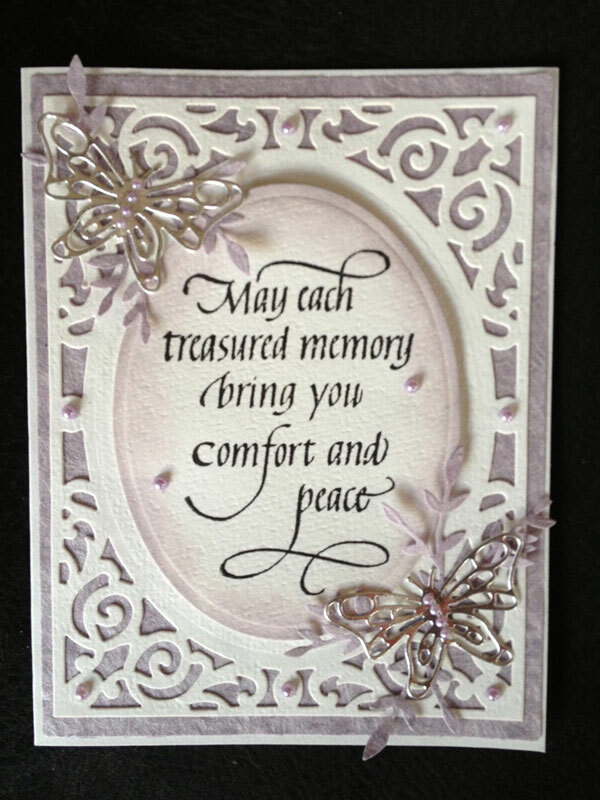 We send our condolences to Joy and her family and thank her for sharing these beautiful cards to inspire us! 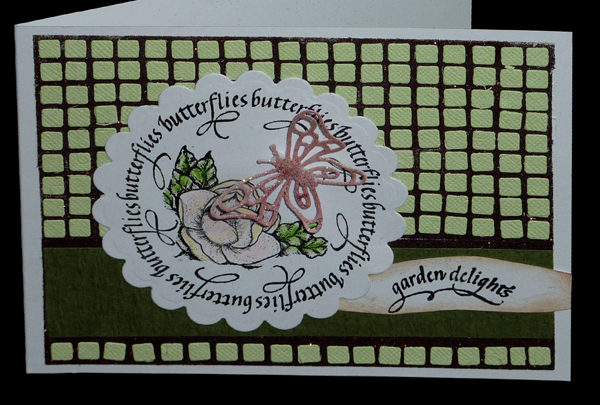 Joy used diecut butterflies from Elizabeth Craft and the Phlox, Ivy Tendrils and Leaves are from Memory Box. 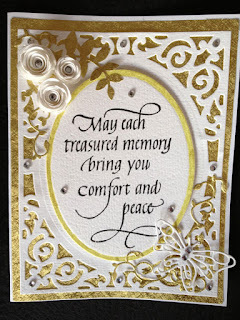 Joy used Spellbinders Matting Basics behind the Filigree Delight which you can find here on our site. Hi Everyone! This is Holly and I have a birthday card to share with you today. My 'flower' is made using Spirelli and if you are not familiar with it, you can find great instructions HERE. It reminds me of the Spirograph set I had as a kid. This card uses paper from PRIMA which was cut to fully cover the card base and another piece was used to cut the oval using SPELLBINDERS NESTIBILITIES FLORAL OVALS . SPELLBINDERS SHAPEABILITIES FOLIAGE was used to cut the leaves from scraps of the same Prima paper. All these pieces were sponged along the edges using RANGER DISTRESS INK in Forest Moss, with the leaves being fully covered in the ink, then crumpled and pinched into shape. The oval had Victorian Velvet ink added and the base piece had Victorian Velvet and Tea Dye sponged on as well. After stamping Happy Birthday from HAPPY FAMILY DAYS with jet black ARCHIVAL INK a scallop circle die from SPELLBINDERS NESTIBILITIES SCALLOPED CIRCLES was used to cut the base for the spirelli. After the thread wrapping was completed, Victorian Velvet ink was sponged over the edges. The same ink was used to stamp the four corners of the base piece, using the decorative designs from the HOME-CONGRATULATIONS set, masking the house from the image. Forest Moss ink was used to stamp the FLOURISH onto the oval. To complete this card, the base layer and oval were attached to a folded card base. Foam dots were applied to the spirelli blossom and it was positioned over the flourish stem. The leaves were tucked under the edge of the blossom and ribbon accents were added. I love how the inks, papers and ribbon match so nicely. Again, another fun time working with great products from Quietfire Design. May Your Home be Filled!